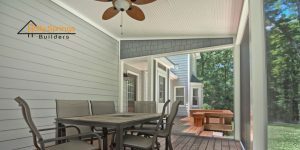 Hiring a local company for your home project, whether it is building a deck, screening in a porch or finishing off your attic, may seem intimidating. After all, you’re about to spend your hard-earned money and you want to make sure it’s done right. Plus, you might be worried about what’s involved. Where do I start when I want to have a deck built? Do I need to get a permit? How will billing be handled from the builder? Holly Springs Builders can help you through the project from beginning to end. We want to put your mind at ease, so we’ve created a basic procedures list of how we work. Now, you can know what to expect for your next custom project. We are using a deck as an example here, but the steps are similar for most of our projects. Initial Meeting – After you call us, we’ll set a time for an initial meeting. At that meeting, we walk around the area and discuss your project. Plan to spend a little bit of time with us so we can make sure to get all the details about what you are picturing in your mind. After that, we’ll send you an estimate, a contract, and a certificate of insurance. Read more about how we create estimates for your deck. Signed, Sealed – When you sign the contract, you pay a 25 percent deposit. Meanwhile, we apply for a permit with your city or town or Wake County to begin the work. The permitting process for residents is usually fairly simple and quick. Some common holdups could include septic systems, city/county code or utility lines. Generally there is a work around any of those minor delays. Work Begins – We’ll let you know what day we plan to arrive. On that date, we’ll dig the footings and then have the local inspector take a look. It is always good if someone is home when we get started in case we run into any new questions, and please make sure we have access to the area where we will be working; that your pets are somewhere safe away from construction. Framing – Next up is the framing, which is when we build the basic outline and supports of the deck. After that, we have another inspection, again by the city or town. Completion – During this stage, we’ll get an electrical inspection if that applies to your job. Then we’ll finish up the work. Finalize – At the end of the project, we send you a bill, but not for all of it. Instead, you pay the last 10 percent when you are completely satisfied and delighted with your new outdoor living area and the contract is completely fulfilled. What questions do you have about the home project process? We’re happy to explain it during our phone call or initial meeting. Contact us today to get started.